I was pleased to return to Bali again in June/July, especially as my trip coincided with Galungan. 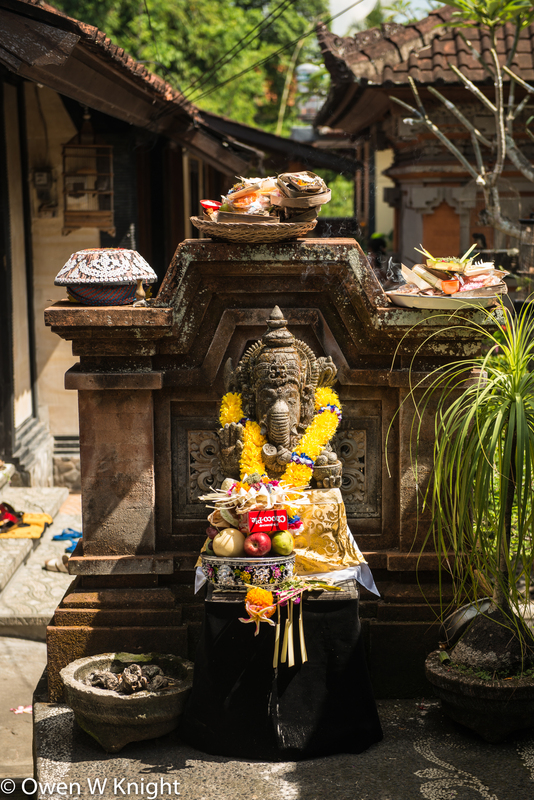 Galungan marks the beginning of the one of the most important recurring religious festivals in Bali. It celebrates the victory of dharma over adharma. It is a time when spirits of relatives who have died and been cremated return to Earth to visit their former homes, returning on the final day of the celebration, Kuningan. Families have a responsibility to be hospitable through prayers and offerings. 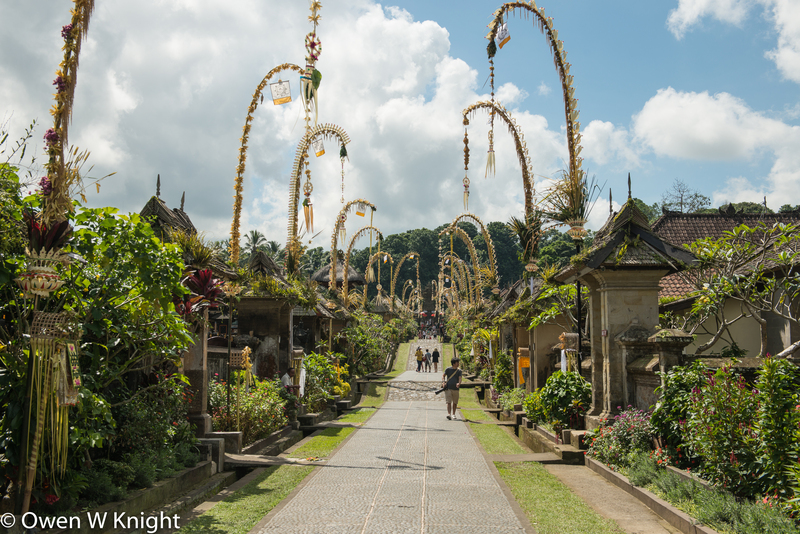 The date of Galungan is calculated according to the 210-day Balinese calendar, and always falls on a Wednesday. 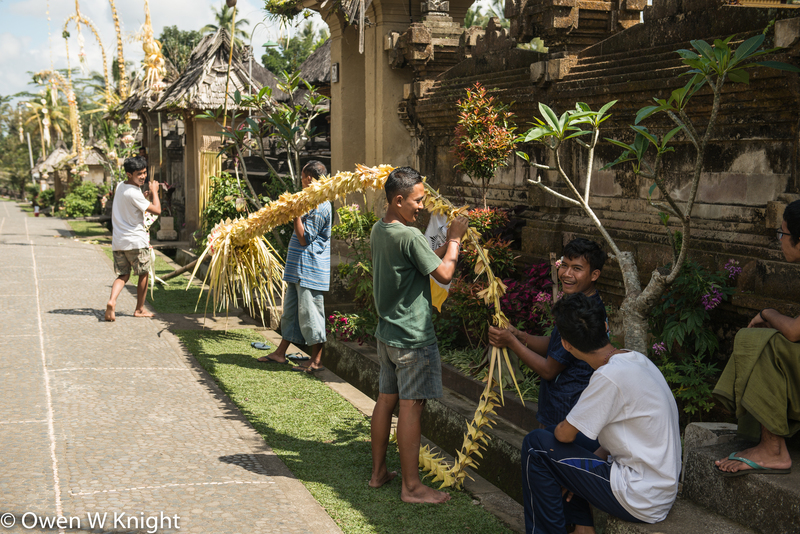 To an outsider, the most visible signs of the celebrations are the penjor – bamboo poles decorated with palm or coconut leaves, from which offerings are suspended. 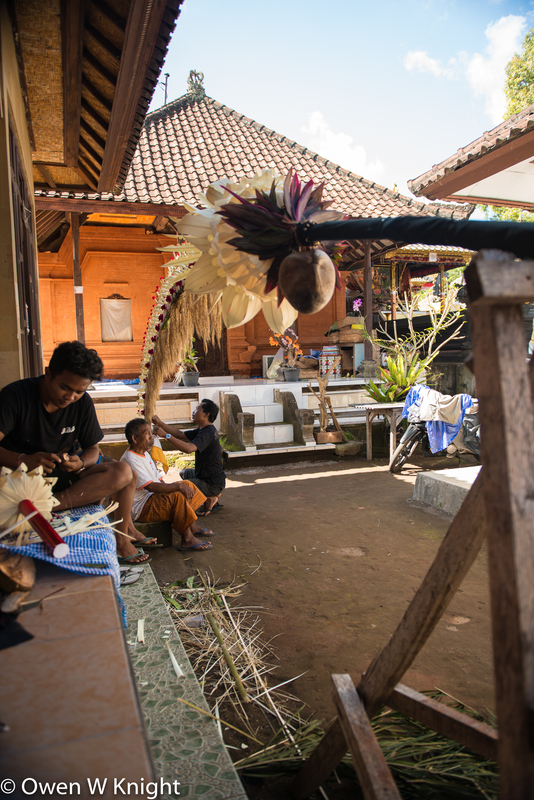 The penjor are erected by the side of roads and many families make their own, to display outside their home. At the end of the festival the penjor are burned. The ashes are scattered on the fields as fertiliser. New penjor will be made for the next occurrence of the festival. A number of days around Galungan are designated for particular purposes. 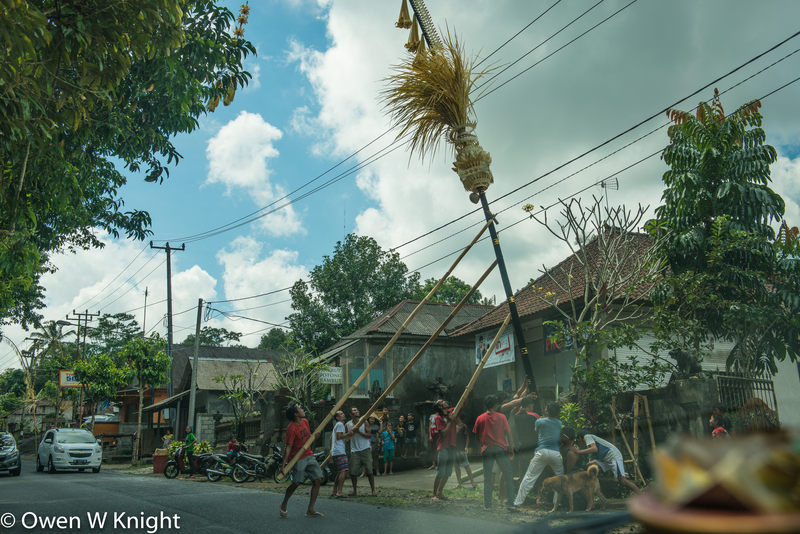 Driving through the forest, north of Ubud, I saw groups of people selecting and cutting their ideal bamboo pole, with a curved tip, to form the basis of their penjor, together with coconut and young palm leaves for the decoration. Many are simple in design, but the process can be quite competitive and some families will spend up to a million Rupiah on a single penjor. 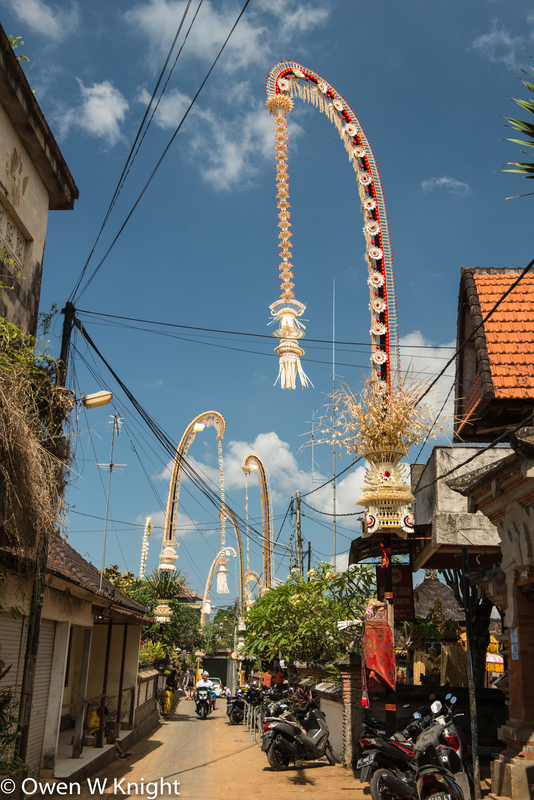 At Galungan, a penjor must contain the following elements: a bamboo pole, a leaf, a coconut, sanggah cucuk (a triangular shaped cage made from bamboo, with offerings, including a cake, placed inside). It represents a temporary throne and a welcoming to the Gods, with yellow and white strips of material as a holy offering. …and the major towns and cities. Not as easy as it may seem. This photo, taken from the car, shows the collaborative effort involved. 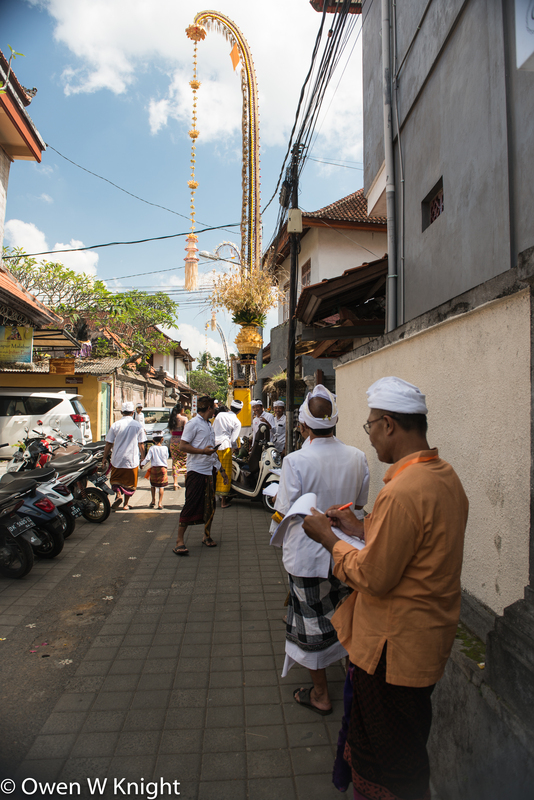 Back in Ubud, I asked a group carrying clipboards what they were doing. They showed me a list of some forty penjor they were visiting to inspect and judge. I should have asked the criteria. 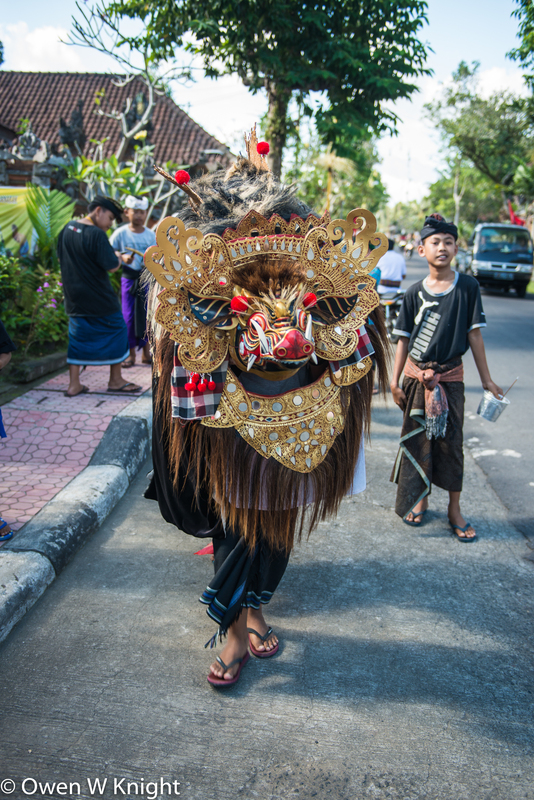 Barong is ‘a lion-like creature and character in the mythology of Bali, Indonesia. He is the king of the spirits, leader of the hosts of good, and enemy of Rangda, the demon queen and mother of all spirit guarders in the mythological traditions of Bali. The battle between Barong and Rangda is featured in the Barong dance to represent the eternal battle between good and evil’ (Wikipedia). 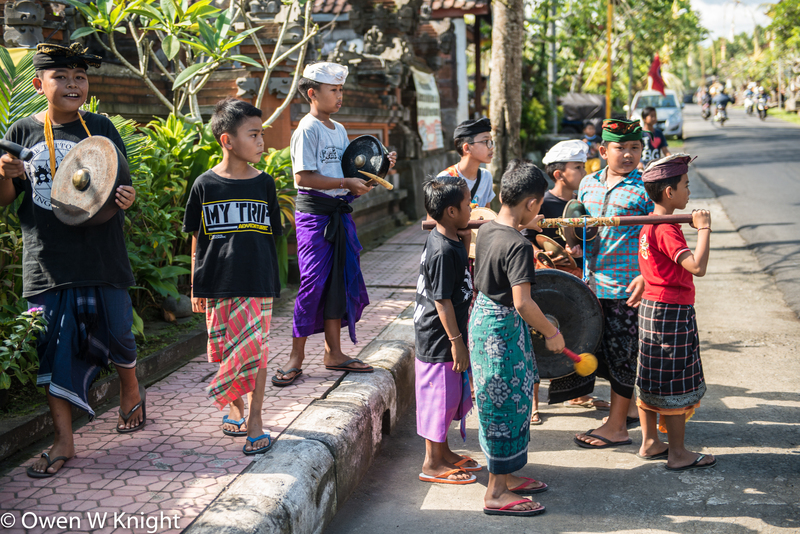 At Galungan, children enjoy making a Barong. Two of them operate it from inside and a group will walk around towns and villages making music and a Barong dance. They will collect modest donations which they share to contribute towards the cost of their education. 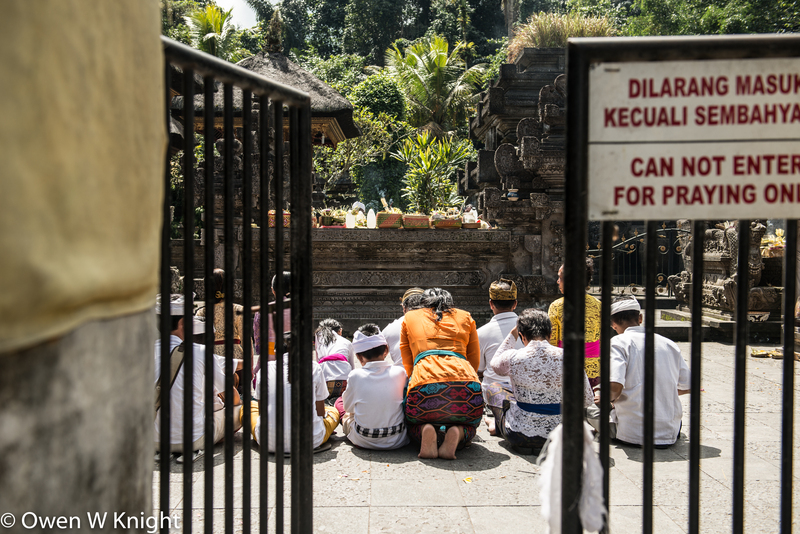 Hindus will visit their temple on Galungan, usually in the morning. This provides an opportunity to dress up in their best finery, and very smart they look too! 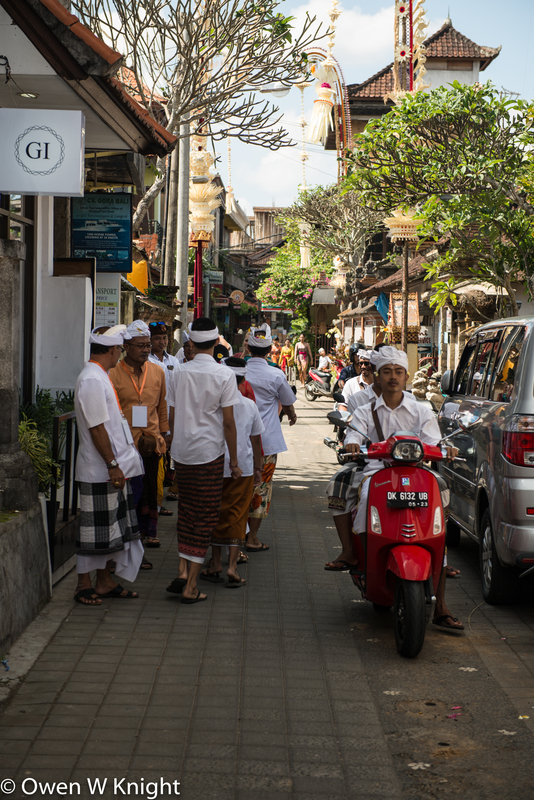 All across Ubud, local men were dressed in immaculate white, while women were dressed in exotic materials, usually in yellow or green. Although this is a day of celebration, it is also a day of devotion. Offerings to the Gods are made daily, but today they are grander. I’m sure that Ganesha will enjoy his offering of Choco Pie. 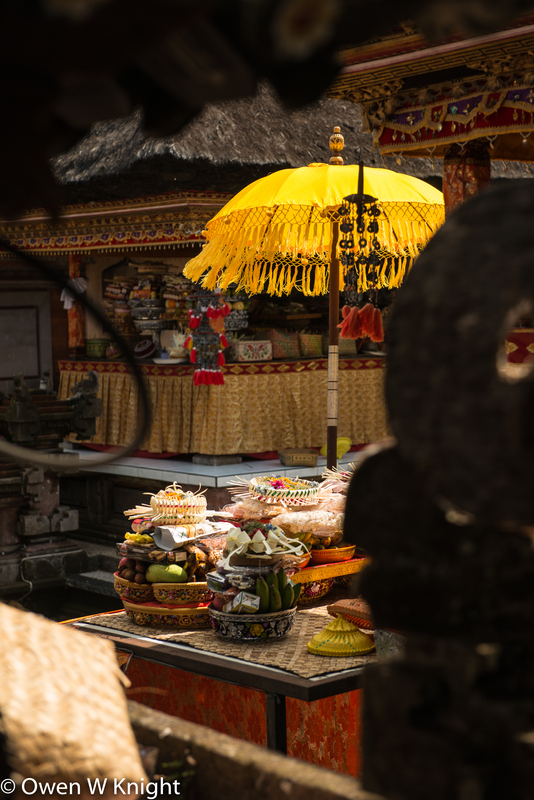 The period of festivities comes to an end with Kuningan. 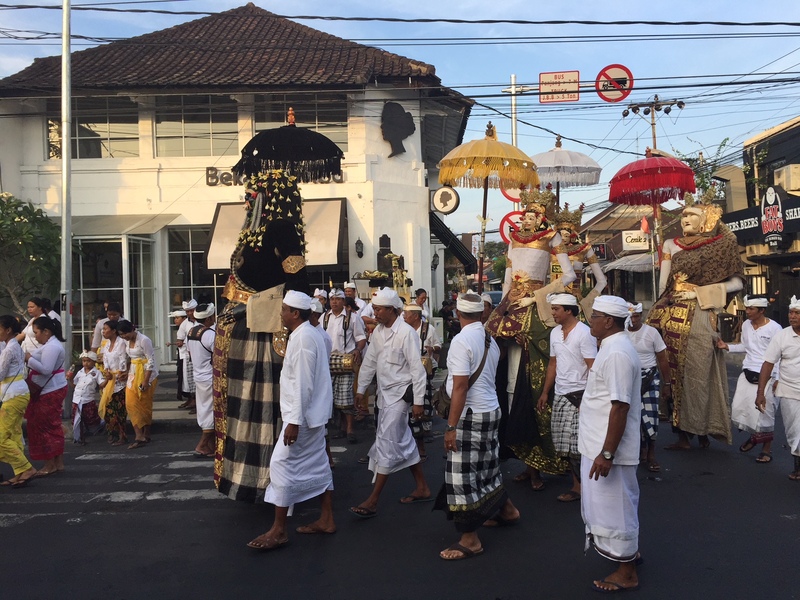 I enjoyed this procession, which held up traffic in one of the busiest streets in Seminyak, as it progressed slowly, with frequent stops. No one seemed to mind. 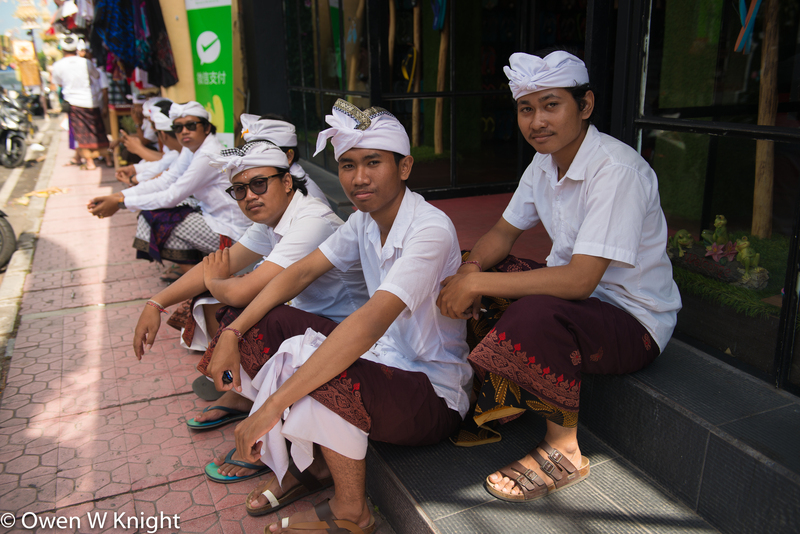 The Balinese are lovely, gentle people who welcome visitors and are pleased to answer questions about their traditions.